A Netflix Film Original - The Christmas Chronicles debuts November 22 is a sponsored post written by me on behalf of Review Wire Media for Netflix. The Christmas Chronicles is a wishful, hilarious, family festive adventure. 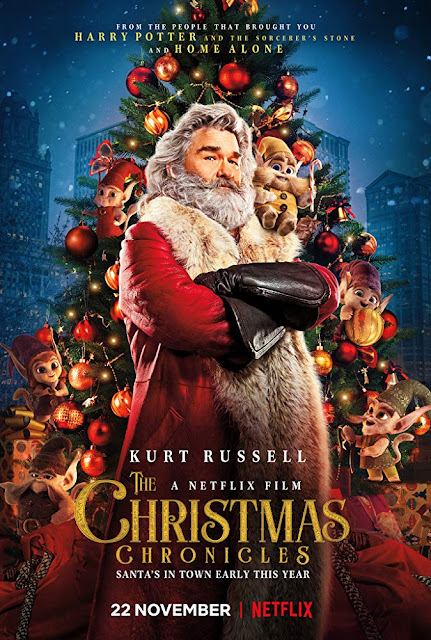 This is a live action family film with a well established director and big profile actor in Kurt Russell. From producer Chris Columbus (“Home Alone”, "Harry Potter") and director Clay Kaytis ("The Angry Birds Movie"), The Christmas Chronicles, tells the story of sister and brother, Kate (Darby Camp) and Teddy Pierce (Judah Lewis), whose Christmas Eve plan to catch Santa Claus (Kurt Russell) on camera turns into an unexpected journey that most kids could only dream about. After staking out Santa’s arrival, they sneak into his sleigh, cause it to crash and nearly derail Christmas. As their wild night unfolds, Kate and Teddy work together with Santa - as you've never seen him before - and his loyal Elves to save Christmas before it's too late. The Christmas Chronicles premieres on Netflix, November 22, 2018! Be sure to catch The Christmas Chronicles on Netflix November 22! For more information visit Netflix and follow #TheChristmasChronicles on Facebook and Instagram. Check out Nextflicks.tv's review of the movie HERE. Can't decide what to watch on Netflix or Amazon Prime? Nextflicks.tv can give you fresh recommendations on what to watch next. Young Explorer’s Adventure Climber From Simplay3 + #Giveaway! Follow Susie's Reviews and Giveaways's board Pets on Pinterest.